PRO: Signed with the Riders in May, 2017…selected by the Saskatchewan Roughriders in the 7th round (55th overall) of the 2017 CFL Draft. 2018: Played 16 regular-season games, listed as a backup linebacker…registered 16 special-teams tackles…played the Western Semi-Final. 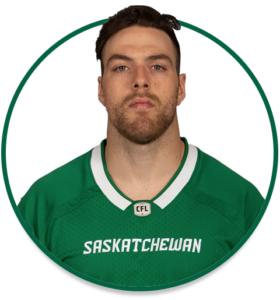 COLLEGE: Spent five seasons at the University of Sherbrooke (2013-17)…played 35 career collegiate games for the Vert & Or…had 152 total defensive tackles, six tackles for loss, four quarterback sacks and one interception.